Chairman Kang, Young Joong of Daekyo Group attended the grand opening ceremony of Midas Hotel & Resort on May 12. 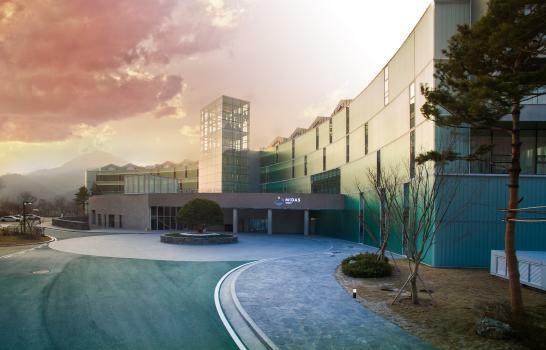 Midas Hotel and Resort, which is a premium resort that aims to offer healthy and luxurious relaxation services to the customer, is located in Cheongpyeong, Gyeonggi-do, which is famous and popular tourist destination for the water sports, mountains, valleys and Bukhan River. The hotel allows customers to enjoy the beautiful scenery from all 72 rooms. Kids JAM, premium kids club, provides you with various kids programs. Banquet and meeting rooms have state of the art facilities and wonderful riverside view. Cafe and restaurant provides delicious dishes and beverage by using of fresh local food. Also, additional facilities such as glamping site, BBQ zone, and multi-purpose auditorium adds value to the hotel. It has easy access to Seoul and other tourist attraction in East Gyeong-gi includes Cheongpeyong Natural Recreation Forest and Nami-island.